I don’t know about you, but as soon as spring rolls around, Peeps seem to mysteriously show up in nearly every aisle in the grocery store. So this week I finally gave in and bought a few of the famous colorful boxes — but of course, decided to gussy them up a bit. My lollipop sticks have been calling my name lately. 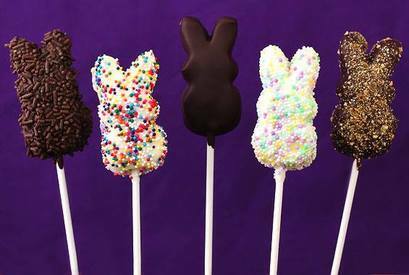 So I turned the Peeps into “pops”, melted a batch of white and dark chocolate, pulled out some of my sprinkles collection (this is a perfect way to use them up!) and went to dipping! I also ground up some graham crackers to make a Peeps version of my favorite s’mores pops. Sure enough, these were totally simple (and took about 10% of the time it takes to make cake pops!!). Perfect for making with kids, or for letting the “kid” come out in your friends and family as they enjoy these!